I'm creating Wizard in my XAF Application. its very excellent product to create the wizards. but i need to remove the header band of the wizard. if any possible to manual override . nor any code snippet for create new TemplateContext and assign. Will try to prepare a solution to your issue soon. We have studied your issue. 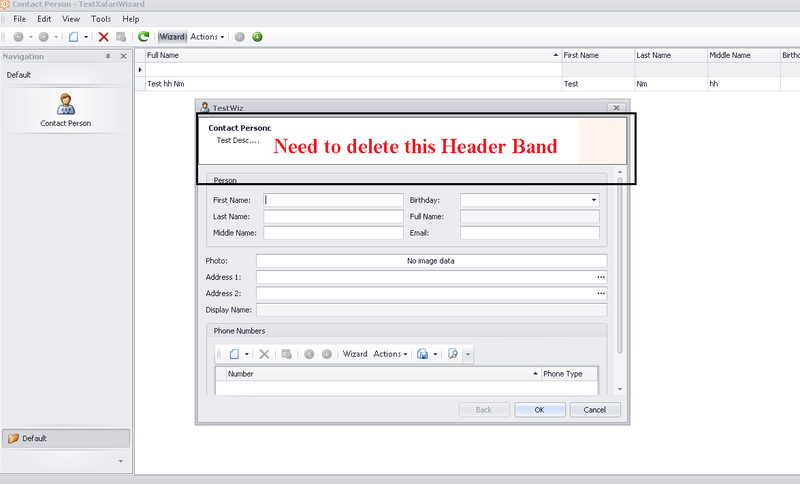 The header band of the wizard added to the form window as a panel. In this class (search the class Xafari.Win/Templates/WizardForm) the panel is of the type private. As a result, we can not delete this panel using controller. Maybe in the future we will make a class with a public property.